In the early eighteenth century, one year before George Washington was born; fifteen families from the Spanish Canary Islands immigrated to what is now known as the city of San Antonio in the then Spanish province of Tejas. Many decades before English- speaking peoples arrived, Spain had encouraged these Islenos (Islanders) to develop more Spanish presence west of Louisiana so as to deter further French westward expansion. Historians note that the Islenos made a spicy “Spanish” stew that is similar to chili. By the 1880’s, as the Texas cattle drives were winding down, Latin women in colourful attire sold a stew they called “chili con carne” made from dried red chilies and beef . These ladies were famously known as “Chili Queens” and they sold chili con carne (nowadays simply called chili), in the market centre. These Chili Queens adorned their wagons with bright lanterns and operated in San Antonio until the 1930’s. At the 1893 Chicago Worlds Fair, a San Antonio chili stand was on display, further popularizing Chili. “Chili parlors” also sprang up, even outside of Texas, in the early 1900’s. An Illinois chili parlour advertised it’s product as “Mexican Chili”, amusing because Chili is strictly a southwest American concoction. Serious Chili devotees insist that chili should not contain beans. And actually, original chili didn’t contain tomatoes either. Beans probably were used as a meat extender at first and then people came to like their inclusion, but Texas-style chili is beanless. 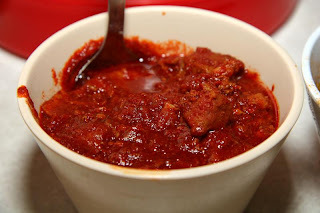 Here is an authentic old Texas-style Chili recipe. Adapted from Jane Butel.’s Southwest Cooking. You can and should refrigerate the chili and later skim off any excessive grease. The chili will taste better when served the next day. There is an annual chili cook-off held in Terlingua, Texas. There you can find a myriad of different chilis, some made with beer, chocolate or coffee, and all manner of ingredients. A few years ago, one fellow won the cook-off but was disqualified after officials discovered he had mixed a batch of samples from a half-dozen contestants and offered it up as his own entry. Some historians believe that chili began as trail food. Others disagree. Chuck wagon cooks might or might not have used dried Chile peppers as a spicing if they were available. One thing is for sure – Chili is definitely good groceries. And today there is a chili variation for everybody, even vegetarians. I have just the person to give this recipe to. He enters a chili contest every year. Wow awesome recipe,looks so tasty. With all that chili and the garlic you add, my Hubs would feel right at home with your cooking. I wanted to tell you that there is a company looking for food blogs to review their cast iron items. I haven't made chili in awhile. I think it's time to make a batch. I like soaking three or four different kinds of beans to put in my chili. Since turkey burger is on sale, I'll be using that as the meat. To the devil with the after-effects! Chili it is tonight! MISSED PERIODS: He will surely win with this. KALYANI'S PLATTER: I'm happy you like it. MY JOURNEY WITH CANDIDA: You can omit some of the hot peppers but the Ancho peppers are not hot and add a flavourful colourful dimension. I have sent you e-mail msg. SUSANNE DRAZIC: Nothing wrong with many beans I suppose and poultry is ok too but I prefer brisket or chuck beef. Very thick, hearty and delicious looking chili too. MALLI: Thank You very much for your kind words. LIZZY: Super bowl menu ? I have a nice wings recipe and other football favourites. See my 10/13/2011 Tailgating Food Tactics for more great ideas. Thank You. Thanks for sharing the history of chili, it was very interesting. I would miss the beans in the chili if they weren't there, although your recipe does sound delicious. Enjoyed reading about the historical origin of chili. With all the spices and chili peppers in your recipe, it sounds delicious. I really like beans in my chili, though. WORDS OF DELICIOUSNESS: This is just the original recipe. You may certainly add beans (and tomatoes too. I like pinto or kidney beans. DEEPS@NAUGHTY CURRY: Yes, no beans at first. They were added to extend the dish but are so good almost everyone wants beans in their chili. JOYCE: I used to have a Tabasco cookbook with about 10 recipes in it, must have lost it. Yeah chili is good groceries for superbowl party. One big pot, get a bunch of disposable bowls but use real spoons, feel free to add beans if you like. GAIL M BAUGNIET: Go ahead please and add beans if you wish, it's perfectly OK.
MISHA GERICKE: You haven't ever had chili? In New Orleans they serve hot dogs with chili. Perhaps you have canned chili in supermarkets in South Africa. If you can obtain Ancho chilies you are halfway there. Chili is GOOD. Ha ha I loved the story of the winning chili cook-off. Nice guy! I have a recipe very similar..... sans beans and tomato but since I no long ever eat meat, I haven't thought of it for some time. My son makes it often and has won chili cook-off's with it. i've made this but with gross improvisations to suit our taste..so much that after reading this recipe it could hardly be called chilli corn carne! it looks so red truly like a chilli queen! looks delicious...love the vibrant color ! NATURAL ONE: I'm glad you like it. MANZANITA: I thought that was funny too when I first heard it. I think many people eat too much meat.Between juicing and all we use a lot of vegetables. Congratulations to your son's chili championing. Take care. THE JUNKIE BOOK: Those ground Ancho chilies are colourful for sure. SONALI PRADHAN: Thank You. The colour is superb. and hadn't considered kidney suet. But that is available here, and I love chili(with a combination of dried ancho, pasilla, serrano and cascabel chiles and a touch of bitter chocolate), so I will give it a whirl next time. Added advantage is to make kidneys, a speciality where I live. ALEX: You got the right idea with the chili pepper mixture and that touch of bitter chocolate. When I was a little boy my dad had a piece of that suet wrapped in cheesecloth in the icebox and every time he used it it was fabulous. Actual kidneys I don't like. NUTSCHELL: The original chili recipe I recount here is not quite like modern day chili. Nowadays beans and tomatoes are commonly used with ground beef. First thing to consider is if you like the taste of cumin. The Ancho peppers are not hot but have a nice flavour. Perhaps you will like this recipe. Happy weekend to you. ALEXIS AKA MOM: You are welcome. Enjoy. MIRIAM: Hi Miriam, you could probably make a meatless chili that would be delicious. ahh..this looks so rich & tempting! Loved the recipe! TEENA MARY: Thank You for your complimentary words.